Look closer, though, and it is easy to distinguish Hasulak and D’Amato from the standard young-Aspen ethos of “work enough to get by, play the rest of the day away.” Their “bags” habit, for example, has no nefarious connotation; for Hasulak and D’Amato – whose names have not been changed to protect their identity – it reflects their work ethic, entrepreneurial spirit, devotion to one another, and desire to make a healthful impact on the world. 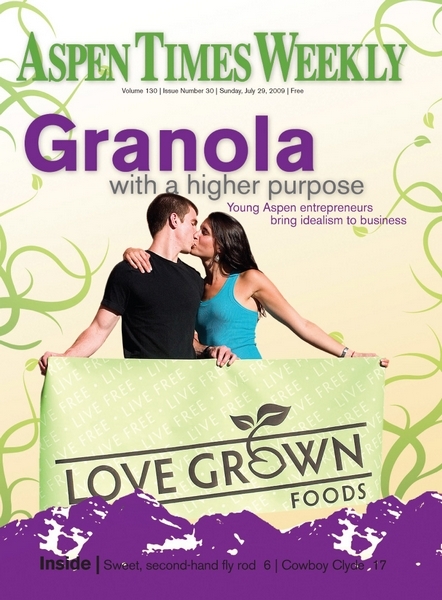 “Doing bags,” in their jargon, means putting labels on packages of granola, the first product to come out of Hasulak and D’Amato’s company, Love Grown Foods. The couple have no employees and a tiny budget, but they have drive and focus, so many of their nights are spent meticulously placing stickers with the Love Grown logo on 12-ounce plastic bags, readying their next delivery. Ordering bags with the logo already in place would have meant less work, but thousands of dollars in additional expense. Bag nights, in fact, are something of a luxury for Hasulak and D’Amato. Other nights are spent baking the granola, in a commercial kitchen they borrow from a caterer, located in Aspen’s Eagles Hall. There are delivery days: The granola is carried in markets and shops from Aspen to Glenwood Springs to Denver, and this past week, the two made a quick trip to Denver to drop off samples for a buyer at the Kings Soopers supermarket empire, a step toward getting their product into City Markets throughout the Roaring Fork Valley. 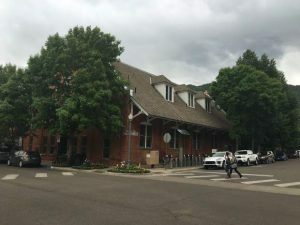 A recent Saturday was spent handing out samples at the City Market in Aspen, which stocks Love Grown granola, and has found it a surprisingly popular item. There are also the behind-the-scenes tasks of ordering ingredients, accounting and strategizing. 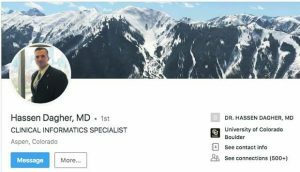 And then there are day jobs: Hasulak is a teller at the Aspen branch of Wells Fargo bank, while D’Amato splits her time between instructing Pilates, giving therapeutic massage and doing nutritional consulting. 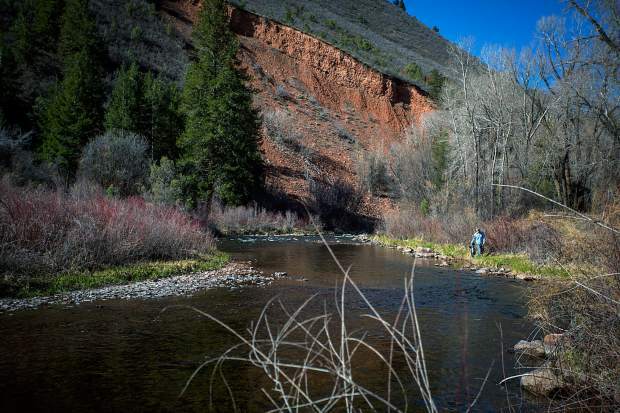 D’Amato grew up in Aspen, and she remembers as a kid her mother, Beth Cashdan, studying articles on nutrition, putting Coca-Cola and food dyes off-limits, and gathering the family to the table for home-cooked meals on a nightly basis. (Her father, Tony, owns a construction company, and is nearing retirement.) Hasulak, a product of Tempe, Ariz., watched his father put in long days, eventually becoming managing partner of Fitch, an architectural design firm. “My dad, he works just as hard as I do,” said Hasulak, adding that his mother brought a similar devotion to raising the children. D’Amato, however, may be. She is the health-food fanatic who believes nutritious products like Love Grown granola (baked with no refined sugars, no preservatives, etc.) should be available to everyone; who says of her cooking, “No matter what ingredients you use, the main ingredient is love.” When the two settled on granola as the initial product, it was largely because Maddie had fond memories of her mother’s home-baked granola. But both are well-rounded, and share each other’s primary characteristics. As a high school sophomore, Hasulak got into soccer, and as a byproduct, began focusing on his health, with a particular interest in healthy fats. His drive to achieve is softened by politeness, maturity and a long-term goal to use business success for societal benefit. D’Amato lettered in three sports at Aspen High, was her class’ head girl and student body president, and participated in the International Baccalaureate program. The two met during their freshman year at Denver University. Hasulak asked D’Amato to the freshman formal; she declined, but they stayed friends and eventually became romantically involved. For their final year of college, the two were roommates in a house that had little in common with the standard booze-and-bongs scene. Among those values was a seriousness of purpose: Both Hasulak and D’Amato graduated in three years. Since graduation, they have become even more focused on their goals. In the past year, D’Amato has earned her certification in Pilates, massage therapy and nutritional counseling. Hasulak was a bellman for a stretch before taking the job as a teller. He also began studying Spanish, but gave that up to concentrate on the business. One of the few times Hasulak and D’Amato veered off-purpose was a night in the DU library when they were supposed to be studying for finals. They got distracted by the business they looked forward to starting, and spent four hours thinking about a name for the venture. Thus was born Love Grown Foods. The company’s product was likewise in progress while they were still in school; in the winter of their final year, Hasulak and D’Amato began making experimental batches of granola and blind-testing them on their friends. Healthfulness was a primary concern, and they eventually found they could make the taste sweet enough without any refined sugar – not even the brown sugar D’Amato’s mom had used in her granola – by using only agave and honey as sweeteners. After an estimated 100 trials, they agreed on a recipe. (Love Grown Granola is now available in three flavors: cinnamon apple walnut, sweet cranberry pecan and raisin almond crunch.) Earlier this year, Love Grown became a registered business – the fact of a recession doesn’t seem to have crossed their minds – and their products hit the shelves in the spring. When the couple brought their product to John Hailey, the longtime store manager of Aspen’s City Market saw more than just love in the granola and the enthusiasm behind it. He also saw exceptional packaging, a desirable product, and an ability to deliver a store-ready item. Hailey began stocking Love Grown granola earlier this month – making it one of a tiny handful of locally made products on City Market’s shelves – and even gave them an end-of-aisle display. Building the company, along with Hasulak and D’Amato’s day jobs, leaves the couple with little time for anything else. So they have gotten creative in how they socialize. Doing bags becomes a date night. D’Amato invites her friends to take her Pilates classes as a way of spending time together. A big part of their social life revolves around the two families they baby-sit for – another example of mixing jobs with pleasure. Hiking and biking are rare occasions; concerts and dinners out even rarer. When D’Amato is out of town, Hasulak sees it as an opportunity to squeeze in even more work. That idea extends to the whole of Aspen. A refrain of Hasulak and D’Amato’s is that there’s no way they could have gotten off to such a fast start without the support of people like Hailey; Purr Design, the company that created their logo and includes an old Aspen friend of D’Amato’s; and Conundrum Catering, which lets them use their kitchen at a bargain price. Hasulak and D’Amato have bigger plans for Love Grown. Probably the next item on their plate will be nut butters, a subject that seems especially close to Hasulak’s heart. “People don’t know – nuts are so good for you. They’re such good fats,” he said. “No one has taken all the nuts, branded them, told people why they’re so good for you.” Further down the road they see adding energy bars and gels, and trail mixes. But the vision behind Love Grown is more expansive than the products and profits they hope to make. 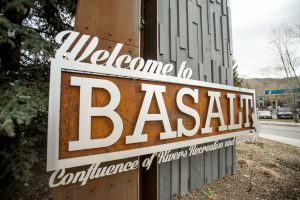 One major goal for Hasulak and D’Amato is to add their substantial energy to the movement that is fighting for better foods – and not just for the Aspen shopper. “The ultimate goal is making health more of a right than a privilege,” said D’Amato, who has priced her granola with accessibility in mind. To help consumers actually see and consider the ingredients, Love Grown’s granola comes in a see-through package. The two expect the company to be good for them as well. Hasulak’s notion is to work hard while he’s young, energetic and child-free, so that if and when he and D’Amato (who are not married) have kids, they might be able to slow their pace and focus more on enjoyment and one another. Which leaves the question: Is Love Grown a good thing for Hasulak and D’Amato now? Hasulak says his friends remind him of the importance of a balanced life, the need to make time for family, the outdoors, social gatherings. He has already passed on holiday visits back to Arizona to see his parents. But he has his own sense of what balance can be, and so far, he isn’t falling off the beam. However, you get the clear sense that, if it hadn’t been Love Grown, Hasulak would have created some other enterprise – maybe the real estate development company he’s long thought about, or an online wine business, another interest of his. He and D’Amato seem wired differently than most 22- and 23-year-olds. “It’s like, What else would we do?” said D’Amato.